What's in Your Bot Pocket? A Data Bot with general info about the BU CS 350 class. 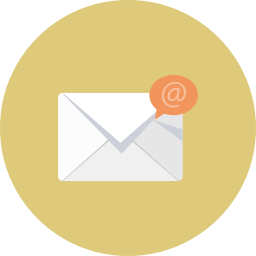 Get instructor emails, homeworks, and class links. 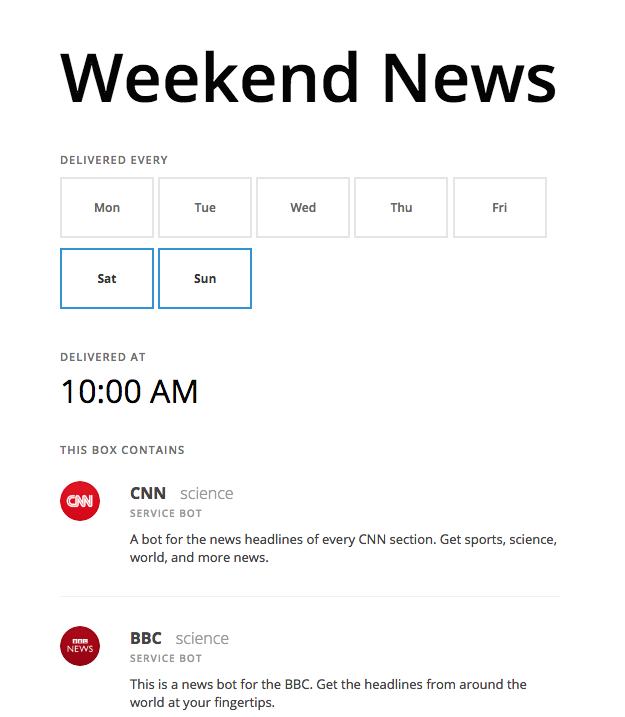 A bot for the news headlines of every CNN section. Get sports, science, world, and more news. 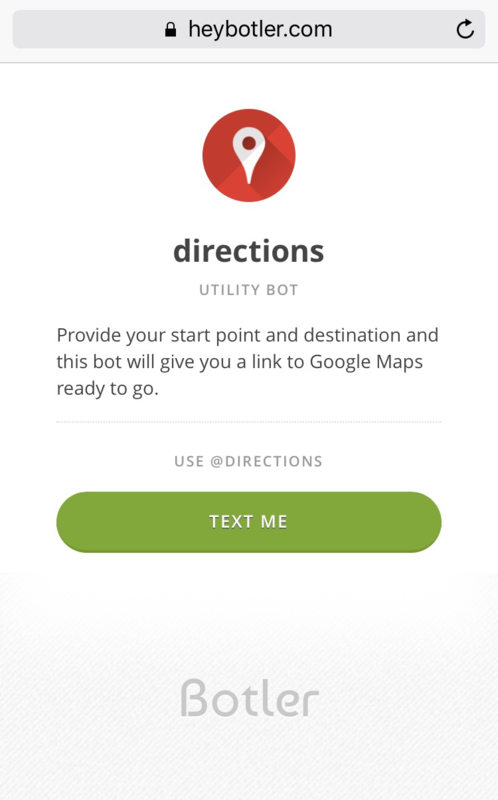 Provide your start point and destination and this bot will give you a link to Google Maps ready to go. Information for Pressed Cafe in Nashua, NH. Find out our hours, menus, address and discounts! 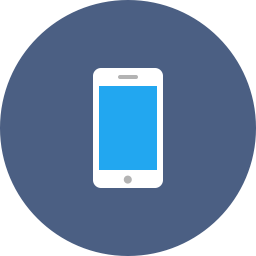 Get the latest stock price for any company with a simple text. You can also add symbols to your portfolio for quick access! This is the bot for Toast POS. Get training and support help, as well as important notifications from this bot. This is a news bot for the BBC. 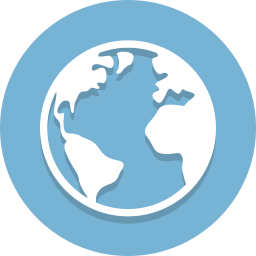 Get the headlines from around the world at your fingertips. Botler is the fastest way to deploy a bot which can do anything you want. For example, you can build a bot for a community that makes info more accessible. The official bot of the OSA 2016 convention - July 4th weekend at the Rhode Island Convention Center. Use bots which are actually useful. Botler provides one of the best bot experiences. We make bots useful to you, unlike other platforms where bots are just a novelty. @Toast how do I close out day? @OSA_16 what are the current events? Free deployment - even on SMS. When you deploy on Botler, users can access your bot by using your bot handle (e.g. @directions). 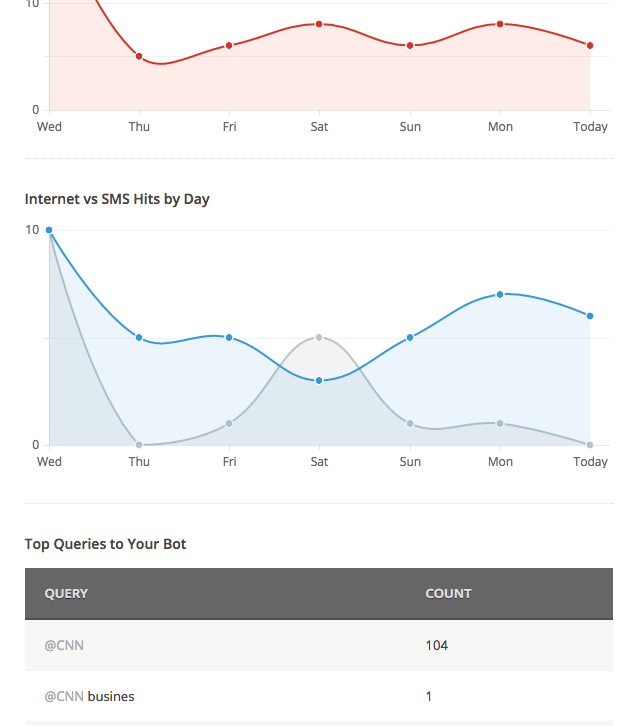 No SMS Costs Users can reach your bot online or over SMS by texting Botler's number, and it costs you nothing! Send Text Notifications Need to update a user or provide a notification? 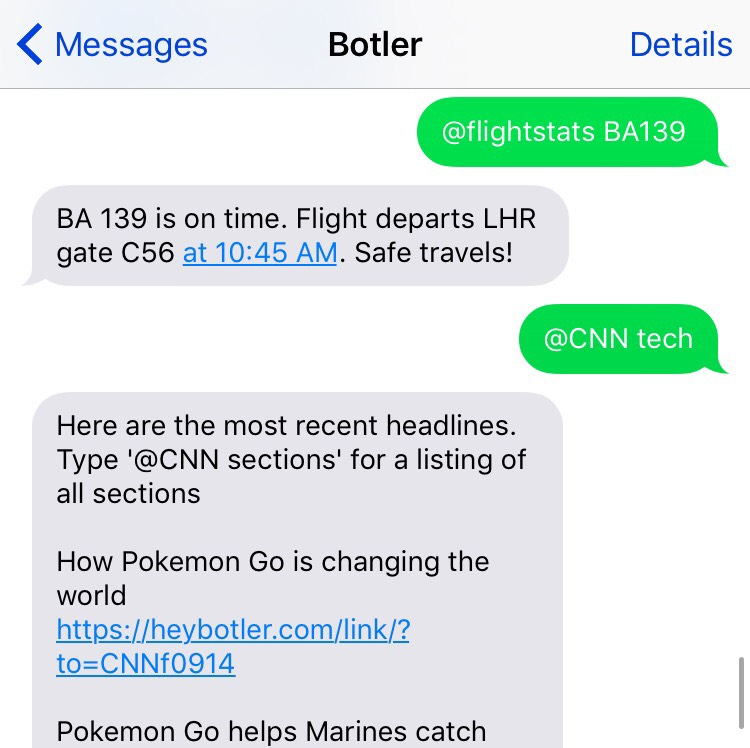 Botler lets you send it right to a user's phone over text. Everyone is a Bot Maker Even if you don't know how to code, you can deploy a bot which can serve static info (such as class details) to users. Access any bot, even without Internet. Access any bot by using its bot handle. Don't have Internet? Stuck in the middle of nowhere? Traveling abroad? You can still reach any bot by texting it. 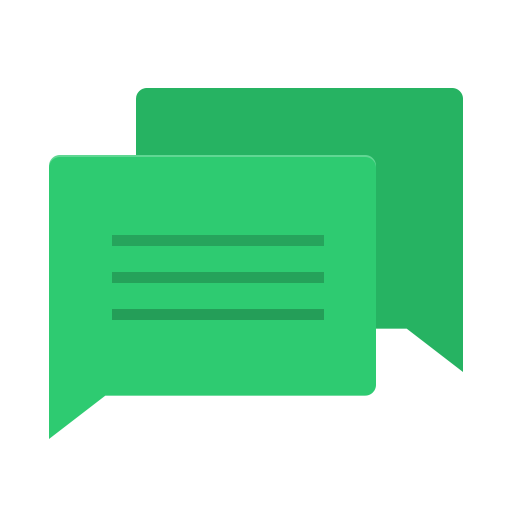 Botler helps you create useful bots very easily, and makes bot building accessible to more people. Deploy on Your Stack You maintain your bot code on your domain/server. This means you can use any language you want, and access any API's. Security Botler simply receives user queries and sends them to your endpoint. This means you will never have to give Botler any internal access to your stack. We know you probably don't use many bots, but Botler will make them indispensable. Privacy Botler does not give your phone number or email to a bot maker. This means you can browse and use bots knowing your information is safe. 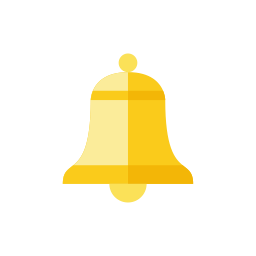 Use Any Bot from a Single Number On Botler, any bot can be reached by texting Botler's number, without needing to save a new number for each bot. This means you can use a lot of bots. Botler will tell you how many people are using your bot, how they are using it, and what mediums they use. Get your favorite bots automatically. You can make a Box of bots which will automatically be delivered whenever you want it. Share your bot with just a link. You can share or promote your bot by simple sharing the link for your bot. Your audience can use your bot without even making an account and just texting the Botler number! Start using Botler, no account needed. You can access bots on Botler without even making an account! Receive Notifications With an account, you can receive notifications from a bot - whether it is for sports updates, breaking news or weather. As we mentioned, your number is not given to bot makers, it stays with us. Build a Bot Which Delights We really want anyone to be able to build a bot. Even if you don't know coding you can build a Data Bot like @BU_CS_350. And if you can code, the possibilities are endless. Bots deployed on Botler are incredibly diverse - there are bots which even monitor lab instruments! Bots by anyone, for anyone. No Code? No Problem We allow all bot users to also be bot makers. 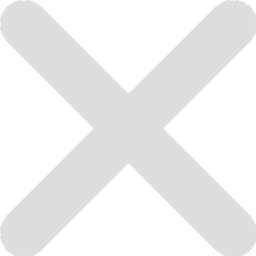 If you cannot code, you can still create a bot that stores and serves static info - info that would otherwise be only accessible by maintiaining an entire website. 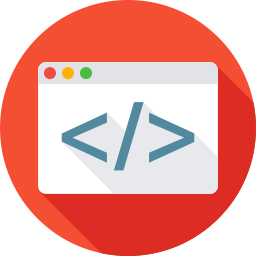 For Programmers, the Fastest Way to Deploy a Bot Botler cuts development time for a bot by more than a half and we reduce the coding experience needed to make a bot drastically. Programmers of all levels deploy on Botler. The @directions bot is built with just 5 lines of PHP. The functionality you can create is limitless. Botler lets you focus on coding the actual bot functionality - using any language - without having to setup and manage an entire stack to deploy a bot. The 47th Annual OSA Convention used Botler. Botler helped the convention organizers interact with guests like never before. Guests asked the bot for the menu, event schedule, and could even ask for help which let the bot notify organizers. In addition to allowing you to develop and maintain your bot on your own stack, Botler provides some extra tools to enterprise bot creators. Dedicated Number If you create an enterprise bot, you will get a dedicated number that you can share with users. 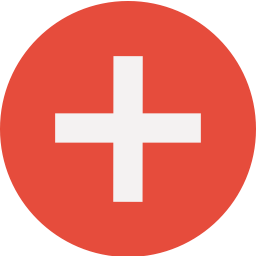 Any user message to that number will be sent to your endpoint, so users do not need to use your bot handle. Identical to Building Your Own Bot - but Half the Work Botler gives you more detailed user info if a user messages the dedicated number, since it is a number that you have shared and promoted. The behavior is identical to deploying your own SMS bot, but without the hassle and dev overhead for setting up the infrastructure. Free Bot Consulting A bot is a powerful new form of interaction with your product or service. We will glady help you figure out how to best capitalize on it and delight your users. 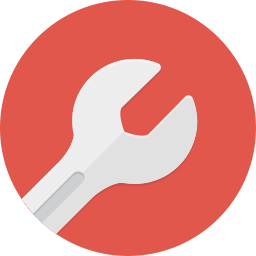 The functionality you can build is limitless, and we can help you get started. Two friends with a passion for building great products. Botler makes it easy for anyone to store and share info without making a website. Handcrafted in Boston, MA. Case Study Enterprise Benefits Already got a Bot? Hey stranger, your hair looks good today.